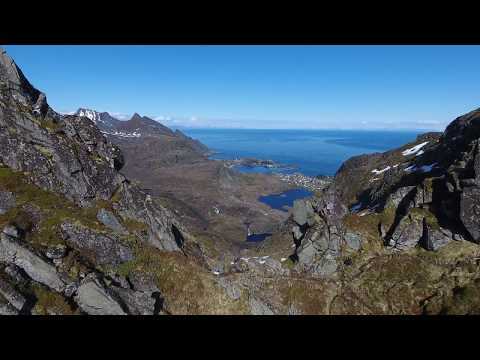 A short half-day hike that includes a fine view over A i Lofoten and Lake Agvatnet. You need to take care nevertheless as this route is only for experienced hikers who know to only tackle it when the path is completely free of snow and who have a good head for heights. As you leave Sørvågen, take the path leading to Munkebu (Munkan). At the first pass (long: 13° 0" 26" - lat: 67° 53" 50") take the left-hand path and take the little wooden bridge over the outlet of Lake Stuvdalsvatnet. Follow the path that goes up a fairly broad ridge where you will find a number of tiny lakes. When you reach the end of the ridge turn left into the valley heading for the narrow pass on the right (the last few metres before the pass are steep). At the pass you will see a little path on the left which takes you to the summit. Return taking the same route.